San Marco is the most touristy of the six sestieri or districts of central Venice. It sits within the big curve formed by the lower half of the Grand Canal. On a day of torrential rain or sweltering heat in high tourist season, we would rather be anywhere than the San Marco district. Trying to make your way down narrow lanes past disorderly tour parties... the time we watched drunk young US tourists spitting from the Rialto onto boats ... hearing waiters insult their foreign customers... The weight of tourism in this part of Venice can sometimes seem intolerable. But away from the shopping streets between the Rialto and St. Mark's, away from the swarming pigeons and tourists, there are some quieter spots, and some charming, unexpected views from bridges which put Venice back into perspective. We still wouldn't like to live close to St. Mark's in the summer; the principal routes are too busy to navigate, the ferry stops overburdened, the shops and restaurants are too expensive. But in the evening, or in the winter, even the lanes of of San Marco can be pleasant to wander. We like sitting in Campo Santo Stefano once the noisy buskers have taken their transistor radios away, or admiring the Carpaccio painting in San Vidal nearby. The Piazzetta at Carnival time is busy but fun, and the cafe orchestras in St. Mark's Square are a definitive part of the Venetian experience. This is the most heavily tourist area of Venice, and in high season it's hard - though not totally impossible - to escape the crowds. It's also expensive for accommodation, eating, shops - whatever you're looking for, you're unlikely to find any bargains around San Marco. The district is most notable, of course, for San Marco itself - St. Mark's Basilica and the surrounding area. Here you'll find Piazza San Marco (St. Mark's Square), filled with pigeons, tourists and cafe tables. This is known simply as 'the Piazza'; no other public space in Venice is honoured with the title 'piazza'. The museums in the square are worth a visit, and so is the pretty clocktower. Tourists queue to ascend the campanile (belltower) for panoramic views over the city. And some of the finest views in Venice can be seen from ground level, from the small square, the Piazzetta, which separates the cathedral from the water. Here you can look out over the end of the Grand Canal, towards the Salute church or over the lagoon to the island church of San Giorgio Maggiore. This area is the first and principal goal of travellers, tourists and daytrippers. You'll encounter most of them in the Piazza itself or in the maze of shopping lanes leading up to the Rialto Bridge. This is one side of the 'triangle' which makes San Marco the simplest sestiere to navigate. The three points on the triangle are St. Mark's, the Rialto, and the Accademia Bridge over to the west, and they are linked by well-signposted routes through lanes and campi (small squares). Basilica of St. Mark - Venice's great sight: a historic treasure-house of riches and loot. St. Mark's Square - probably the most recognisable and dramatic piazza in Italy. Ducal Palace - this is where Venice's ruler, the Doge, lived and where the city's business was carried out. Torre dell'Orologio - The Renaissance clocktower in St. Mark's Square. Campanile di San Marco - climb the famous bell-tower of St. Mark's. La Fenice - Venice's famous opera house, recently rebuilt after a devastating fire. Scala Contarini del Bovolo - attractive external spiral staircase; closed for restoration but can still be viewed. Palazzo Fortuny - Gothic palazzo; atmospheric exhibition space. Shopping - if you like designer shops, or are looking for expensive glassware, this is the place to come. 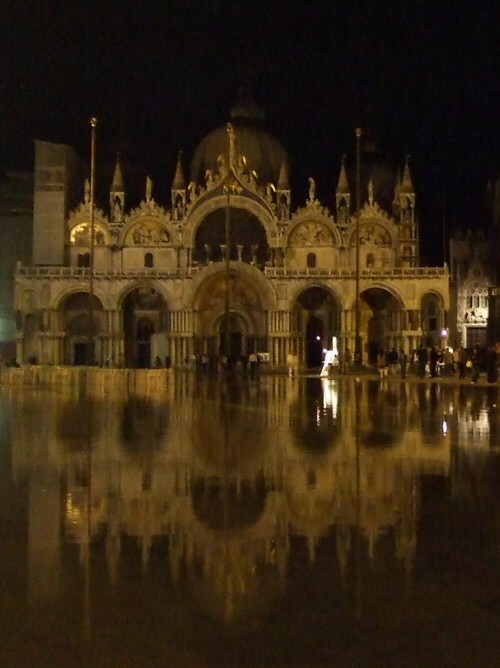 Acqua alta - this low-lying part of town is one of the best places to witness high water. The tide only has to be slightly higher than normal to start flooding the Piazza. Bridge of Sighs - a small covered bridge which once led to the Venetian prison. Museo Correr - the museum has a range of displays including some fine artworks. The local archaeological museum is attached. A very large proportion of Venice's hotels are in the San Marco area. It's a good area to choose for a short stay packed with sightseeing, and you'll also find most of the city's luxury hotels here. For a longer or more peaceful stay, we'd recommend a quieter part of town. The most high-profile places to eat and drink are the legendary coffee-houses of St. Mark's Square. Caffè Florian and Quadri are the two grandest and the most historic, both with elegant interiors, tables on the square, orchestras and inflated prices. The less-renowned Lavena has equally high prices and a jolly orchestra, but I've had very rude service there and will never return. Florian's is my favourite, with its frescoed rooms, fine steaming hot chocolate with cream, and delicate silk teabags. You can also buy light meals and snacks. Nearer the Grand Canal, Harry's Bar is the place to go for a cocktail: the Bellini was invented here. There's a very nice cafe/wine bar called Teamo near the Palazzo Fortuny and Campo Sant' Angelo, with a trendy interior and a few tables outside.